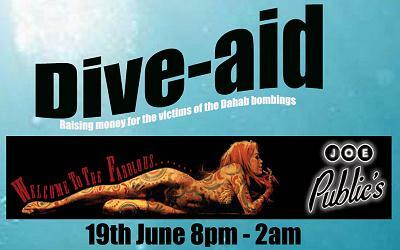 This event is raising money to help families in Dahab cope with their loss. It takes place on Monday 19th June at Joe Public's music lounge (underneath Habitat) A fundraising gig featuring 3 of Bristol's finest bands, plus DJ's. Tickets are £5.00 on the door or from the Bristol Ticket Shop. For further details, please see the Dive-aid Flyer.